This is a powerful exploration of the debilitating impact that politically correct “multiculturalism” has had upon higher education and academic freedom in the United States. In the name of diversity, many leading academic and cultural institutions are working to silence dissent and stifle intellectual life. 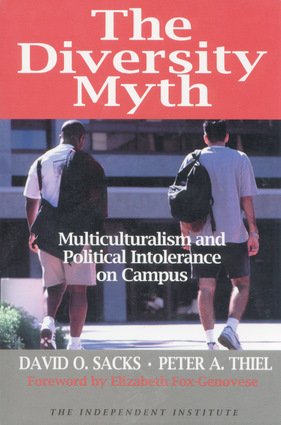 This book exposes the real impact of multiculturalism on the institution most closely identified with the politically correct decline of higher education—Stanford University. Authored by two Stanford graduates, this book is a compelling insider’s tour of a world of speech codes, “dumbed-down” admissions standards and curricula, campus witch hunts, and anti-Western zealotry that masquerades as legitimate scholarly inquiry. Sacks and Thiel use numerous primary sources—the Stanford Daily, class readings, official university publications—to reveal a pattern of politicized classes, housing, budget priorities, and more. They trace the connections between such disparate trends as political correctness, the gender wars, Generation X nihilism, and culture wars, showing how these have played a role in shaping multiculturalism at institutions like Stanford. The authors convincingly show that multiculturalism is not about learning more; it is actually about learning less. They end their comprehensive study by detailing the changes necessary to reverse the tragic disintegration of American universities and restore true academic excellence. David O. Sacks is vice president of product strategy at PayPal, Inc. He has worked as a legislative aide to U.S. Representative Christopher Cox and received his A.B. in economics from Stanford University. His articles have appeared in the Wall Street Journal, National Review, Policy Review, and Academic Questions. Peter A. Thiel is chairman and CEO at PayPal, Inc. He has worked as a derivatives trader at Credit Suisse Financial Products, a securities lawyer for Sullivan & Cromwell, and a speechwriter for former education secretary William J. Bennett. He received his A.B. in philosophy and J.D. from Stanford University. They both live in Palo Alto, California.